Hoboken is an urban coastal community with a population of more than 55,000 residents, a municipal budget of over $118 million, and more than 550 full-time municipal employees, is challenged by antiquated and failing roads, water mains and combined sewers. 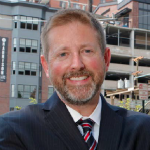 In his current role Stephen Marks manages the city’s capital planning and programming function with a focus on resiliency, sustainability, green infrastructure and Sandy recovery. Mr. Marks is a state licensed and nationally certified professional planner. He is also certified as a floodplain manager by the Association of State Floodplain Managers and as a green associate by the U.S. Green Building Council’s Green Building Certification Institute.